Needless to say, many of the predictions in this article didn’t pan out. Original Editor’s Note – Statements by aviation enthusiasts that airplanes will wipe out cities, destroy fleets and armies, and win the next war prompted this article by Lieut. Hogg, noted writer on military topics. In it he makes startling revelations about the effectiveness of the airplane as a military weapon. The observations and opinions expressed in this article are those of the author and should not be construed as reflecting the official views or opinions of the United States Navy Department. During the World War airplanes sank no battleships, destroyed no city, and failed in every attempt to bomb or gas an enemy out of a military position. The first 30 days of any major war will see the complete elimination of air forces of belligerent powers. No aviator entertains the thought that he is going to fly over the enemy anti-aircraft battery in time of war – and live to tell the tale. Air raids over London and Paris during the four years of the World War destroyed less than $5,000,000 worth of property and killed fewer than 700 enemy civilians. It would take 75,000 bombers to carry the load of bombs equivalent to the weight of shells carried by the 15 battleships of the U. S. Navy. The cruising radius of those bombers would be only 500 miles. A battleship can travel 15,000 miles, regardless of weather. A shell will drill through heavy armor plate, or through concrete walls. It explodes inside to produce a shattering, internal explosion. A aerial bomb, having no such power of penetration pops off like a paper firecracker against whatever it hits. It would take 28,000,000 pounds of phosgene to “wipe out” an area the size of New York City. To accomplish this the enemy would have to have 14,000 large bombing planes and 280 naval airplane carriers to bring the planes within striking distance of New York. 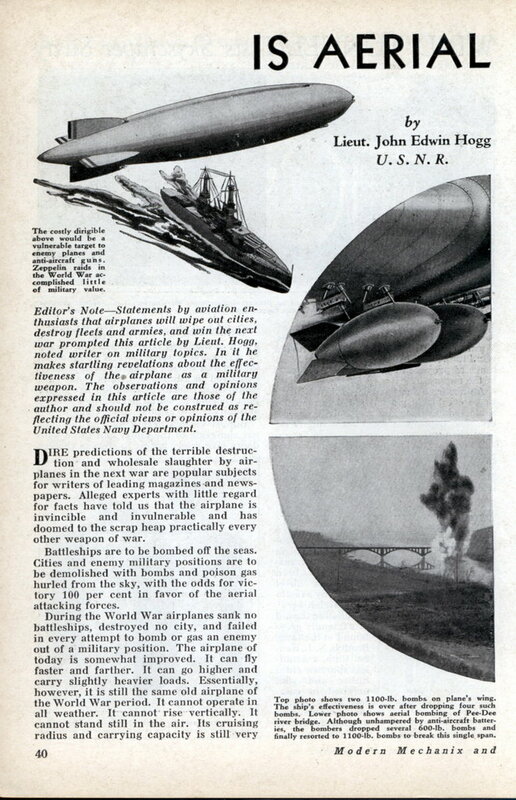 Dire predictions of the terrible destruction and wholesale slaughter by airplanes in the next war are popular subjects for writers of leading magazines and newspapers. Alleged experts with little regard for facts have told us that the airplane is invincible and invulnerable and has doomed to the scrap heap practically every other weapon of war. Battleships are to be bombed off the seas. Cities and enemy military positions are to be demolished with bombs and poison gas hurled from the sky, with the odds for victory 100 per cent in favor of the aerial attacking forces. During the World War airplanes sank no battleships, destroyed no city, and failed in every attempt to bomb or gas an enemy out of a military position. The airplane of today is somewhat improved. It can fly faster and farther. It can go higher and carry slightly heavier loads. Essentially, however, it is still the same old airplane of the World War period. It cannot operate in all weather. It cannot rise vertically. It cannot stand still in the air. Its cruising radius and carrying capacity is still very limited. It is highly vulnerable and cannot be adequately armored. In short, it retains all its inherent limitations. In a military sense it offers at best only a hit and run method of fighting. It can take nothing. It can hold nothing. It cannot stay and fight! The natural hazards of military aviation even in times of peace are recognized by every government in the form of increased pay to the men who choose aerial duty. The mortality of peacetime naval aviation averages 100 per cent every five years. The hazards of military aviation in time of war will be infinitely greater. Indeed, it is not difficult to find many intelligent flying officers in both the United States Army and Navy who predict that the first 30 days of any major war will see the complete elimination of the air forces of belligerent powers. This estimate, of course, may be too high. Nevertheless, our own War Department conservatively estimates that 25 per cent of our air service personnel and equipment will go out of action during every 90 days of actual war conditions. There was no such thing as an effective anti-aircraft gun during the early stages of the World War, but no sooner were major aerial bombing raids attempted before antiaircraft guns made their appearance. The first such guns were crude and ineffective. Their improvement, however, was very rapid, and they, more than fighting airplanes, put an end to the major German air raids over London and Paris. Toward the end of the war it was almost certain death for any aviator attempting to fly over an enemy anti-aircraft battery. Improvements in anti-aircraft guns and gunnery have advanced in recent years beyond any improvements in aircraft. Rangefinders and fire directors have been developed to perform feats of apparent magic instantly and accurately beyond the average human imagination. Among scores of both army and navy aviators, I have yet to meet even one who entertains the thought that he is ever going to fly over an enemy anti-aircraft battery in time of war-and live to tell the tale. The German Zeppelins of the World War period carried about ten times the load of bombs that any airplane can lift today. The Gotha bombing planes carried two tons, which is about the same load that a good bomber can get off the ground nowadays. Unopposed as these raids were except by airplanes and crude anti-aircraft guns, the whole series of air raids over London and Paris during the entire four years of the war destroyed less than $5,000,000 worth of property. They killed fewer than 700 enemy civilians, which is about the number killed in London traffic accidents every year. London and Paris were far from “blown off the map” when the war ended and Germany had paid dearly for a series of aerial offensives of very questionable value. She lost 486 trained air men in the Zeppelins and airplanes that were brought down by the enemy. The air raids had cost her tens of millions of dollars; all for the privilege of killing some 700 non-combatant civilians, and smashing up $5,000,000 worth of enemy property. From a military viewpoint these air raids accomplished less than nothing. Editorial champions of aerial military supremacy are forever writing about the terrors of bomb-dropping from altitudes above the range of modern anti-aircraft guns. They close their eyes to the fact that no aerial bombing can be effective unless the aviators can clearly see the target they are trying to hit it is a well-established fact that any bomb-dropping from an altitude of more than about 4000 feet is notoriously inaccurate. The lower a bomber can fly the greater becomes its bombing accuracy, but there will be no low-altitude bomb-dropping in any future war. The modern anti-aircraft machine gun discourages that. These guns, throwing a veritable hailstorm of 50-caliber bullets, are effective tip to 7,500 feet, and will pierce a quarter of an inch of boiler plate at that height. A large bombing plane may carry two tons of bombs. It would take about 5000 of the largest modern bombing planes to carry the potential load of destruction represented by the shells in the magazines of a battleship, and the battleship has a cruising radius of 15,000 miles anywhere on the seas compared with the bomber’s 2-ton load and 500-mile cruising radius. Moreover, a battle fleet or a battery of field artillery can STAY AND FIGHT as long as it remains afloat or as long as transportation lines can be kept open. The bombing plane must quit as soon as its two ton load of bombs is dropped. All the military bombing planes in the world today would have to wait for favorable weather, and would then be capable of only a comparatively short overseas flight with half the load of shells a battleship can carry 15,000 miles regardless of weather. It would take roughly 75,000 bombers to carry a load of bombs equivalent to the weight of shells in the magazines of the 15 battleships of the U. S. Navy, and the cruising radius of those bombers would be only about 500 miles away from a base of operations. Gas distributed over vast areas by airplanes is another horror-myth overworked in defiance of the laws of physics by aviation enthusiasts. There are gas masks that are effective against all gases. It takes unbelievable quantities of gas to build up an effective concentration over even a limited area. It takes, for instance, 300 pounds of phosgene to gas an area of 100 square yards effectively. This means that it would take 28,000,000 pounds of phosgene, very evenly distributed, to “wipe out” an area the size of New York City, if there were no gas masks. To accomplish this an enemy would have to have 14,000 large bombing planes and 280 naval airplane carriers to bring these planes within striking range of New York. Does anyone think for a moment that Uncle Sam would be whittling a stick while any oilier nation is building 14,000 bombers and 280 airplane carriers? Some editorial writers claim that an air fleet that could destroy every important British city in a single day, and that the United States may be bombed or gassed from the air by an enemy air force brought to within striking distance in airplane carriers of the submarine type. Such statements are without foundation of fact. There is not in the world today a sufficient number of bombing planes to destroy a city the size of London in a month even if we assume that the British would “sit and take it” while the bombs and gas were being showered upon them. As for “conquering” the United States with an air attack brought to us in submarine carriers, consider’ the facts of the subject. Submarines have been built to carry as many as two very small, folding-wing scout planes. Our Navy has one such submarine. By complete alteration of design, building a larger submarine than any ever built, and leaving out all conventional submarine fighting equipment, it would be possible to build a submarine airplane carrier capable of housing two large bombers. Having noted that 14,000 bombers would be needed to gas an area the size of New York, the enemy seeking to attack America’s, largest city with an underseas air fleet would have to have 7000 submarine carriers. Such a fleet could be built for about $70,000,000,000, and a crew of 700,000 highly-trained men and officers would be needed to operate it .It costs about $500 an hour to operate a single, large, modern submarine. Hence, it would cost about $714,000,000 per day to operate this diving aerial armada. No nation on the face of the earth today could finance such an operation. As an act of war such an attack would have about the military significance of a honeybee attacking an elephant! By some mysterious appeal to human imagination the aerial bomb has been propagandized as a terrible weapon of destruction. A shell is infinitely more destructive. The aerial bomb is dropped at a target and hitting the target is largely a matter of guesswork. There is mightly little guesswork about hitting a target with a shell over ranges up to 25 miles. A bomb and a shell may carry identical charges of high explosive but still the shell is by far the more deadly. Regardless of the altitude from which it is dropped the bomb will attain a velocity of only about 500 feet per second in falling. The shell, on the other hand, is fired from a piece of artillery and has a velocity of about 3000 feet per second. A shell thus has the power of penetration that the bomb lacks. A shell will drill through heavy armor plate, or through concrete walls. It explodes inside to produce a shattering, internal explosion. A bomb, having no such power of penetration pops off like a paper firecracker against whatever it hits. It can produce only an external explosion that is largely wasted upon the atmosphere. In an experimental bombing conducted by the United States Army, using the condemned Pee-Dee. River bridge in North Carolina, for a target, the few 600-pound bombs that made direct hits on the concrete and steel structure dented the bridge but failed to render it impassable. Finally, 1100-pound bombs had to be used to break a single span. Had this trial target been an enemy military position defended by airplanes, modern anti-aircraft guns, and batteries of anti-aircraft machine guns, it is highly improbable that the “attacking” air force could have landed so much as a single bomb upon the bridge. Japan is said to have an air force equal to, or possibly superior to that of the United States. Yet in the recent Japanese military maneuvers in China her air forces accomplished nothing even remotely approaching the predictions so frequently heard from aviation enthusiasts. The aviators did accomplish many important military functions such as scouting, intelligence work, and the like; but even that work was hampered or often completely frustrated by the fighting efficiency of Chinese aviators. Bombing and gassing operations were virtually ineffective. In. one instance 6000 pounds of Japanese bombs were rained down at a group of Chinese snipers on top of an old wooden Observation tower 150-ft. high. After the Japanese aviators had, dropped all their bombs the old tower ‘wasn’t even shattered, and the Chinese snipers were still in action. Since the development of aviation has pointed out .the possibility of civil populations being attacked with bombs and poison gas, popular fancy seems to have eloped with the baseless theory that wars will be so waged in the future. It would be the most useless, extravagant, and illogical method of attempting to win a war. The objective of any war is the subjugation of military forces, hence any attack upon civil populations would be like going after a swarm of bees scattered all over a state, instead of attacking the hive. The aerial bomb that might be dropped upon a cathedral could be used to far better advantage against an enemy supply train. The pound of gas that might be used to strangle non-combatants sitting by the fireside would be far more effective in an enemy military camp. The next war, if it comes, will probably be fought very much like previous wars of history. It will be won by the nation that can make the most intelligent and effective use of every available weapon. It will be won by the side that can close the seas to the enemy, and finish the last decisive battle on land with its soldiers on enemy soil. Weapons, whether they are tanks, battleships, airplanes, bombs, poison gas, artillery, or other devices, are only stepping stones toward the goals of winning a war. Every act of war is merely paving the way for the doughboy with a rifle, and a bayonet in his hands. It is the doughboy that in the final analysis brings a beaten military power to the peace conference. An interesting article. LT Hogg was in many ways prophetic, but not in the way he intended. Obviously, it is easy to gainsay Hogg’s statements and conclusions given more than 70 years of hind-sight. Hogg’s defence of traditional land and naval battle is logical given the technology of the time. 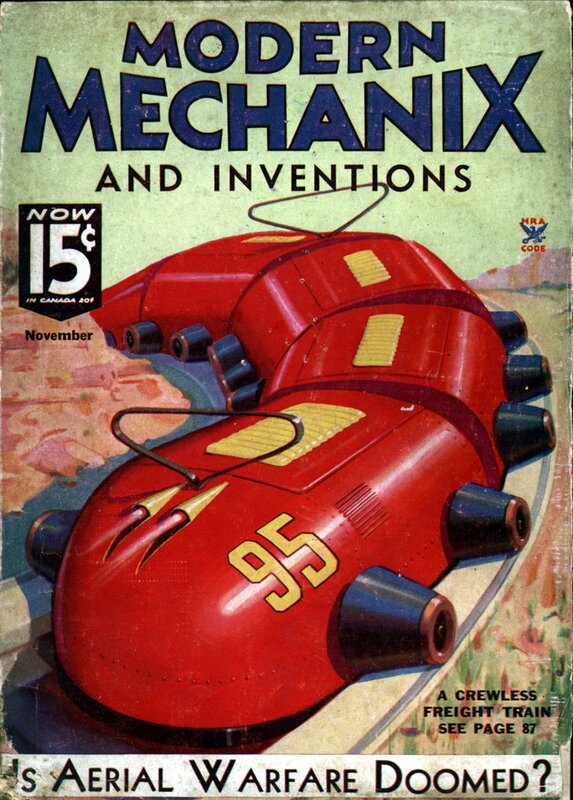 Indeed, aviation as a science, let alone as a weapon, was still in its infancy in the 1930s. The dirigibles, or Zeppelins, of WWI were failures, and for many of the reasons that LT Hogg puts forth. It should be noted however, that the US Navy made excellent use of blimps during the Second World War in anti-submarine patrols. Nevertheless, Hogg’s denouncement of aviation as an effective tool of war is flawed; he relies too much on anti-aircraft weapons. As was seen throughout the Second World War, anti-aircraft artillery was effective, it never placed arial targets beyond the reach of aviators. When combined with fighter aircraft, anti-aircraft defenses were often quite formidable. Bogg’s citing a War Department study expressing a 25% loss-ratio in many cases was too optimistic. Several of the US Army Air Force raids into Germany suffered 25% loss rates per day. In fact, the US 8th Air Force suffered the largest losses in the entire war, regardless of theater. And yet, not a single American (or British, for that matter) bombing force was ever turned back by German air defenses. And the airplane was the equal of the ship. Witness the Japanese sinking of the HMS Prince of Wales and the HMS Repulse on 8 DEC 1941. It should be remembered that the Prince of Wales survived battle with the German Battleship Bismarck, after the Bismarck sank the HMS Hood. The subtext of Hogg’s article is still seen today; armies and navies are obsolete. We know this to be false. No one would argue against the statement that the US Air Force is far and away the world’s most technologicaly advanced air force in the world. Moreover, it is likely that the USAF will remain the dominate air force in the world for generations to come. The same can be said of US Naval Aviation as well. Indeed, a single Carrier Air Group or its Air Force equivelent would likely prove sufficient to any task required in support of US or Allied ground forces. Yes; ground forces. Even today in Iraq and Afghanistan air supremecy is a secondary effort to “boots on the ground” exigiencies of the fight. I submit that without any land forces involved in either campaign whatsoever, that both Hussein and the Taliban would still be in power in their respective nations. Hogg also wrote that victory is achieved by “subjugating (and enemy’s) armies”. This is incorrect. Wars are won when one nation has destroyed their opponents will to fight, not their ability to do so. The German Army of World War One was still an effective fighting force when the Armistice was signed. However, Germany had lost the will to continue the war well before November 1918. Certainly the Japanese military had been virtually anihilated before Hiroshima, but as Hirohito, et al, still had the desire to fight, the war continued until Nagasaki. Even then, mid-rank Japanese Army officers attempted a coup de etat in order to prevent the Japanese Emperor from surrendering. The US Military was never defeated in Vietnam, despite some crippling obstructions placed in its way by Washington. But as 1969 turned into 1970, the US had lost the will to fight, so the war ended with the Paris Accords, in lieu of military victory for either side. It should be noted that despite the overwhelming political advantages held by Hanoi, it was only after the Linebacker II operations, where the US Air Force was for the only time in the war able to bring it full arsenal, sans nuclear weapons, to bear against North Vietnam. Hanoi agreed to peace within thirty days. And yet that war was a victory for the North. Hanoi had the political will to wait until they could take on the South Vietnamese Army without US intervention, and when North Vietnam invaded the South, its victory came swiftly as the South Vietnamese lacked the will to fight on their own. There is an on-going struggle between aircraft designers and the counterparts in the realm of anti-aircraft artillery, and the balance tips towards one side or the other regularly. In the Yom Kippur war, Israel’s Air Force destroyed the air and land forces of Egypt and Syria. In the 1973 Six-Day War, Egyptian Air Defense Artillery, most notably its missile force, literally decimated the Israelis. In either event, it was the Israeli Army that won the fight. No one system or force will be the “end all and be all” for any nation as it prosecutes its wars. Rather, it the combined efforts of that country’s diverse military arms working in concert to destroy their enemy’s will, not ability, to fight, that will decide the contest. In his seminal work: “On War”, the Prussian theorist Carl von Klauswitz postulated that “war is politics by other means.” Politics is based on will. It is for that reason, too, that Hogg’s arguments about what a given operation would or would not cost is also flawed. No war has ever been won by the country that “fought it on the cheap.” Britain gave away practically her entire empire to the United States in order to afford the material needed to continue the fight against Nazi Germany. Frankly, from a purely economic statement, Britain lost WWII. By the time the war finally ended, the British economy was in ruins, and to this day, neither Britain nor France has ever fully recovered. Yet both nations were winners in WWII. They both had the will to pay and price (as JFK put it) in order to win. Hogg should have placed less reliance on technology, and more on human will. It is a lesson to be heeded in every war in every place.